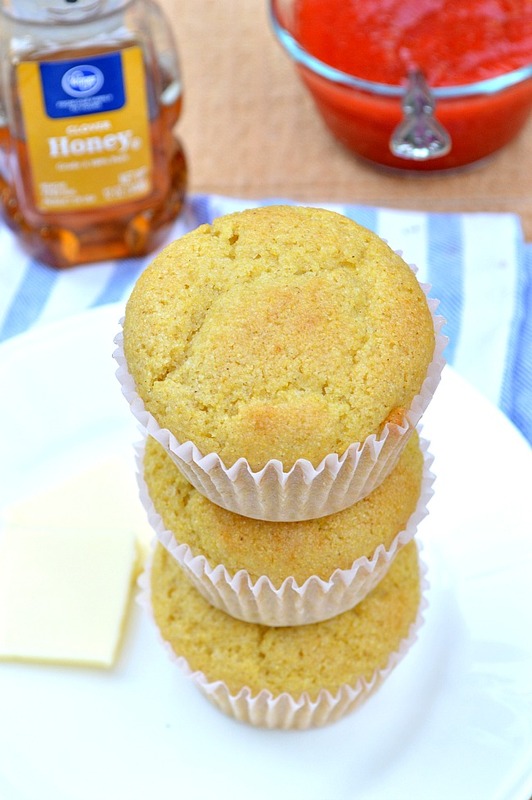 Amazingly light and fluffy Gluten Free Honey Cornbread Muffins with a touch of honey and a whole lot of flavor! Top with melted butter and honey for a real treat. Hey there! It’s Brielle from Breezy Bakes just checking in on your SUMMER FUN…hoping it’s chalk full of friends, family, and barbecues. 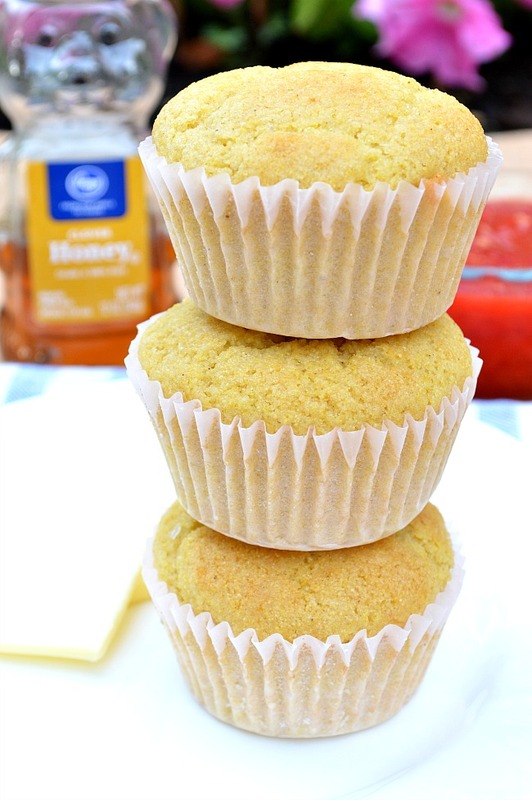 Really I just hope you are barbecuing and potlucking it up so you have a reason to make these super scrumptious, totally tender, sensationally sweet Gluten Free Honey Cornbread Muffins. And if you’re not barbecuing or picnic-ing (or any other kind of traditional summer eating) shame on you! And, well, making these muffins is a good way to start. First of all, can we all just take a moment to oooh and awww over the beautiful color of these cornbread muffins? I mean, does anything scream summer more than vibrant YELLOW??? The color of that taunting, scorching sun shining down on you, tanning (or in my case BURNING) your ever so delicate skin? At least that’s what “sun” means to us Arizonians. However, being in Utah for most of this summer, I’ve come to develop quite a fondness toward the summer sun. Who knew summer could be so pleasant?! And what else better suits summer than freshly picked corn? Corn on the cob, corn salsa, corn salads, grilled corn, you name it! That sweet, crispy, juicy ear of golden kernels has found a permanent place in my heart, tucked away in the section of “Vegetables That Make Me Happy”. Too bad they don’t come fresh year round. Now I know not everyone is a fan of whole corn kernels in their cornbread, but everyone is NOT me. My favorite cornbread is the kind where you chomp into tender, juicy, sweet kernels in every bite. My kids, on the other hand, turn up their noses to that particular texture in their muffins. To each his own. Anyhow, with or without fresh bits of corn, these muffins are absolutely delightful. Apparently they originated from a super secret family recipe that ain’t so super secret anymore. My mom has been making this recipe for years, ever since we lived in Houston. She tasted them at a friend’s house and when she asked for the recipe, she was DE-NIED. She’s still mad to this day that somebody would not share a yummy recipe so others could enjoy. Haha! The wrath of my mama! In true mama bear fashion, she went to this particular friend’s best friend and asked for the recipe, knowing that if anyone else would have the recipe it would be her. I guess my mom should have been a salesman because she ended up with not only the recipe, but an oath swearing she would never tell that she received that super secret family recipe. Annnnnnd, now I have it too. Mwah ha ha! Here is the best part: this gluten free cornbread version tastes just as (if not more) delicious than the original. Now that’s a HAPPY DAY indeed! 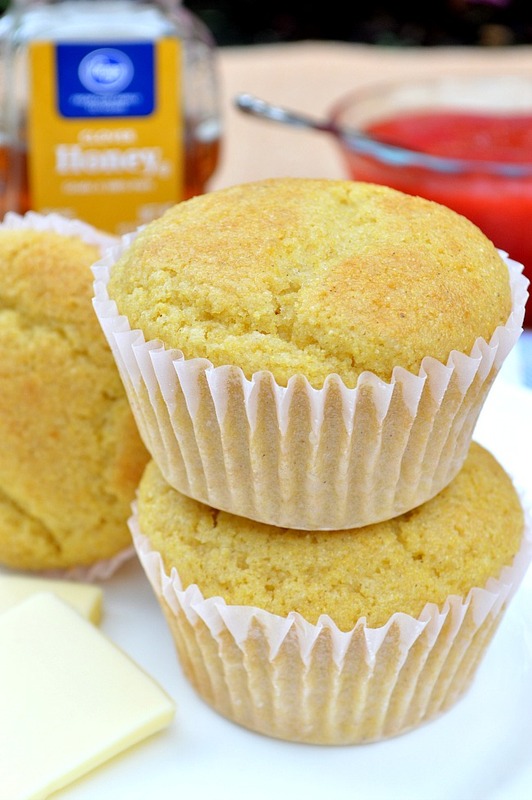 These Gluten Free Honey Cornbread Muffins are super light, perfectly moist, and have just the right amount of sweetness, plus an added touch of honey. Add some butter and a drizzle of honey when they’re warm, and you think you’ve skipped dinner and gone straight to dessert. I love baking cornbread in muffin form rather than squares because they tend to bake better. Sometimes the center doesn’t quite get done when baking a pan of cornbread. Plus, how easy is it for everyone to to grab their own muffin and go, rather than making a mess with squares?! Trust me, just think about it. Muffins are the way to go! Braelyn has probably eaten a half dozen of these since I made them. It helps that they freeze super well so she can pull one out when she’s in the mood for a little carbs with her dinner. That’s another plus for me. I’m all about bake now, freeze later…that is until I can’t shut my freezer door anymore. Ooops! So jump on board before summer passes you by. Grab the grill and your closest friends, throw together your favorite summer smorgasbord, and make a batch of these shining cornbread muffins. Make your own sunshine! 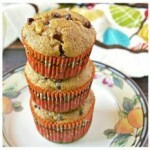 If you enjoyed this recipe, check out some more of my gluten free muffins. 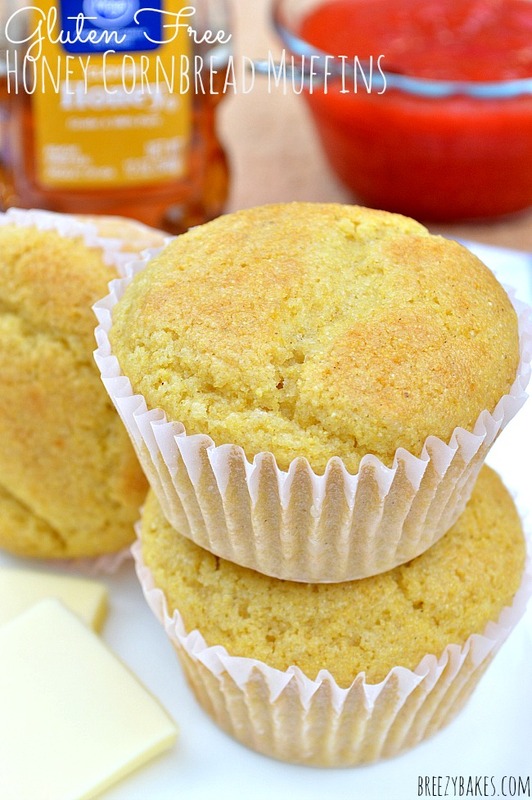 Amazingly light and fluffy gluten free cornbread muffins with a touch of honey and a whole lot of flavor! Top with melted butter and honey for a real treat. Preheat oven to 375 degrees and line muffin tins with paper liners. In a large mixing bowl, beat eggs with a whisk. Add melted butter, buttermilk, sugar, and honey. Whisk until smooth. In a separate smaller mixing bowl, sift together brown rice flour, sorghum flour, potato starch, tapioca starch, cornmeal, salt, baking soda, and xanthan gum. Add dry ingredients to wet and mix until just combined. Fill each muffin tin 2/3 way full with batter and bake at 375 degrees for 18-20 minutes or until tops of muffins spring back at touch of finger or toothpick inserted into center of muffin comes out clean with few crumbs. Allow to sit in muffin tins on a wire rack for 3-5 minutes. Remove from tins and allow to finish cooling on wire rack. Serve slightly warm with butter and honey.